Definition of a barrel spring: A barrel spring is a type of compression spring used to produce linear force where the top and bottom outer diameter are smaller than the center outer diameter. 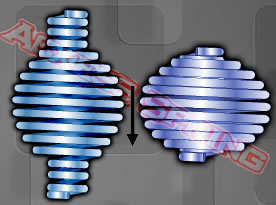 A barrel spring is chosen by end users over a generic compression spring mainly because it may reduce space, prevent buckling, and provide a multitude of shaped configurations to better fit in any designs. Acxess Spring manufactures a variety of different barrel springs. These springs vary based on wire diameter, diameter of the spring, and overall shapes. You can see some of the different examples to your right. All the barrel springs we manufacture are from a wire diameter of 0.006 inches to 0.100 inch wire diameter. Barrel springs can be telescoping or non-telescoping in nature. Telescoping refers to a situation where the smaller coils go inside the larger coils when the spring is compressed. We also offer a variety of finishing options on your barrel spring. Some of the options are zinc plating, gold zinc plating, nickle plating, gold electroplating, passivation, as well as powder coating. Barrel springs prevent buckling aka bowing. When a compression spring is 4 times as long as it is wide the spring will buckle when compressed. 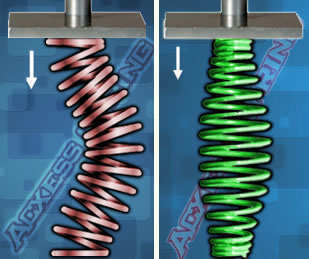 On a normal compression spring this can be prevented by placing the spring over a shaft or in a hole. If this is not a possibility you can use a barrel spring. The shape of a barrel spring, wider in the center than on the ends, allows for the pressure to be distributed differently and gives stability to a longer compression spring. You can see an example of this on the picture to the right. If you are interested to test this theory out take a compression spring that is 4 times (or more) as long as it is wide and compress it down with your hand. When the pressure gets to be too much the spring will buckle under the pressure causing the center of the spring to protrude outward and eventually shoot away from underneath the pressure. Solid Height Reduction. A compression spring will produce force in a linear direction, which is appropriate for most designs where a barrel spring can be used. The issue with compression springs, however, is design restrictions can cause a solid height conflict. For example you need a spring to have a force that requires multiple coils, when compressed these coils will bind on top of each other to the point they can no longer be compressed. This is referred to as solid height, or compressed height. This may be an issue in your design. An alternative in the case is to use a barrel spring that will telescope the smaller coils on the top and bottom of the spring into the larger coils in the center of the spring, thus reducing the solid height. Some of the industries that use barrel springs are the automotive industry, toy industry, drinking bottles where powder will be mixed with water, and the furniture industry. 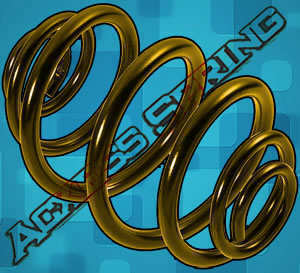 If you have any questions on whether or not a barrel spring would be beneficial for your design please speak to one of the engineers at Acxess Spring by calling (951) 276-2777. Barrel springs are more difficult to design than compression springs because the force they produce is not always linear. As you can see from the two pictures to the right barrel springs can have very different shapes. The force of a barrel spring stops being linear when the coils begin to telescope on the spring. You can see for the blue spring this would happen much faster than the silver spring due to the extreme differences in size and shape. If you wish to test the load on your barrel spring you will need to use a load tester.